Fort Partners has broken ground on the long awaited Four Seasons Fort Lauderdale. It is preceding the demolition of the Tropic Cay Motel, but preceding the Fort Lauderdale International Boat Show. The Four Seasons will be a luxury residential and hotel mixed project offering condos ranging from 800 to 6,000 square feet. Pricing will be between $1.2 and $10 million. Guests and residents will have separate amenity structures however all will enjoy private drives, spa, signature restaurant, bar and lounge, pool deck dining, ballroom, business center, youth recreation area, meeting area, and a cafe and garden. The property is located on a 1.8 acre parcel at 525 North Fort Lauderdale Beach Boulevard. This location affords guests and residents easy access to the Fort Lauderdale Airport, Las Olas Boulevard Shopping and Dining, Galleria Mall shopping and dining, and convenient grocery shopping. 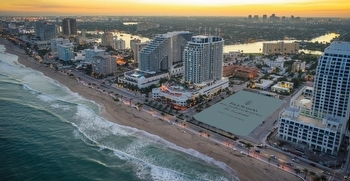 If you are looking for a residence at the Four Seasons Fort Lauderdale or if you are looking for other preconstruction Fort Lauderdale properties, please contact me today!